Najeela is one of Battlebond‘s most intriguing cards to me, and not just because of her cool art! For one thing, Warrior tribal has been a powerful feature of not one, but two different Magic blocks – don’t forget, guys, that Obsidian Battle-Axe is still a thing and does a good impression of a tribal Fires of Yavimaya. For another, she has all five colors in her text box, meaning you can use any of them you choose if she is your commander. According to my online searching, there are actually 44 blue Warriors at your disposal, which is more than I would have guessed. Granted, not all of them are quite as aggressively costed as the other colors’, but that stable includes solid cards like Whirlpool Warrior and Skyrider Elf, as well as legends like the mighty Dakkon Blackblade. Talk about a Commander plant if ever there was one. 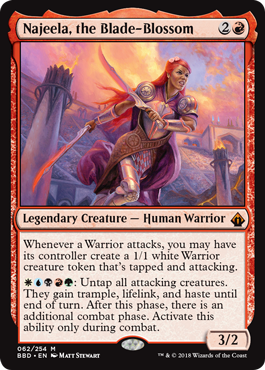 Due to how color identity works in Commander, Najeela is technically a five-color Commander, and a powerful one at that. If you have access to all five colors, you can enable a massive swing in one turn; two combat steps, plus trample and lifelink, is pretty legit. And she makes an army on her own, thanks to making tokens on a Warrior attack. You maybe don’t want her to be attacking a whole lot, as a 3/2 isn’t ideal, but she can help put in a lot of work if you have the mana. And even before she comes online with her five-mana ability, Najeela helps you to go wide. Remember that it only cares about Warriors attacking, so one turns into two, two turns into four, and four turns into a massive headache for your opponent.